Although we don’t need our balaclavas just yet, it is safe to say that we’ve had a few “one-dog nights” so far this month, so it’s time to start thinking about the winter ahead. While our cuddly canines are certainly good at keeping us warm—their internal temperature sits about three or four degrees above ours—it is important that we help them out a bit too. Starr, a TAGS foster dog, trying on her winter jacket. 1. 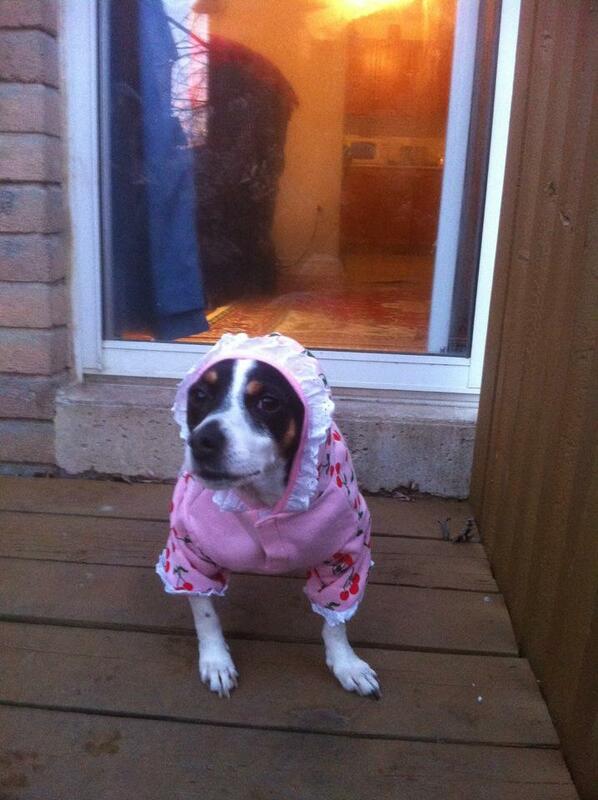 Bundle up your pup! Small dogs, or breeds with short or thin fur, should wear sweaters or jackets when they are outside to protect them from the wind and cold. The clothing should cover them from their neck to the base of the tail, as well as the tummy. If they will not tolerate clothing, just be sure to watch them closely—if they start to shiver too much when you’re out on a walk, consider taking shorter walks more frequently to minimize any prolonged exposure to the elements. 2. Thaw the paw! When you bring your dog in from the backyard or from a walk, be sure to thoroughly wipe in and around all of the pads of his feet. If any moisture or ice is left in there, it can not only cause the dog to limp but can also give him chills for hours. Wiping your dog’s paws will also reduce the risk of his carrying in anything that could cause his paws to become dry and chapped, such as salt or other anti-freezing solutions. If ingested, such chemicals can cause ulcers and irritation of the esophagus and mouth. 3. No-shave November! As the temperature drops, consider letting your dog’s fur grow out. If his full coat is too much, just be sure to avoid going right down to the skin. The extra fur will help keep him insulated against the elements. 4. Just water, no ice please! Cold, dry weather can increase the likelihood of dehydration. Having constant access to fresh water is essential all year round, but for some reason, many of us associate thirst with being hot. Dogs are the same way, so we have to encourage them to drink just as much water when it’s cold out, even if they didn’t just get in from a summer day at the dog park. If your dog is kept primarily outdoors, make sure the water does not freeze over—purchasing a heated bowl will help with this. 5. Check under the bed! While there may not be any monsters hiding there, there could be moisture buildup from all of your pup’s outdoor adventures. Make sure all of your dog’s favourite places to nap are clean, dry and well insulated. Consider tossing his bed in the dryer for a few minutes to make it feel extra cozy. If you have any questions about the above, or any of your own tips and tricks to share, please tell us in the comments! You can also visit us on our website to find out more about our rescue organization and the great dogs we have available for adoption.